Tourism Mission will be your number one source for local events, attractions and things to do! #ExploreMission for a chance of being featured in our social media channels! The District of Mission is nestled on a southern coastal mountain slope, overlooking the lush valley of the mighty Fraser River. 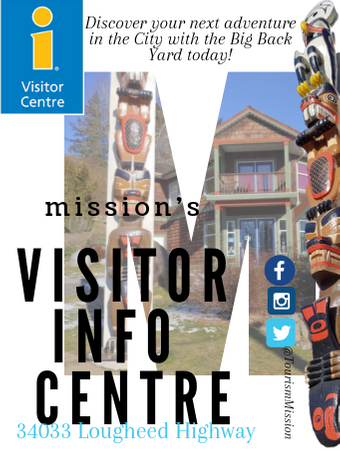 Founded in 1892, Mission, BC was originally inhabited by the Stó:lō First Nations people, and today this rapidly growing and dynamic centre is home to a population closing in on 40,000 residents. Ideally situated, Mission is just a 15-minute drive from the US border, and approximately 70 kilometers east of the City of Vancouver. Mission is surrounded by the incredible beauty of mountainous vistas and natural forest settings. Our climate is warm in the summer and mild and wet in the winter. Flowers bloom most of the year, as the area is naturally hospitable to a wide variety of plant life and vegetation. Topographically, Mission enjoys an immense variation of hillsides and gullies which maintain natural neighbourhood enclosures, spectacular views, and a sense of permanence. Mission has a unique and colourful history. It is the site of Canada’s first train robbery, B.C.’s first rail link to the United States, one of the earliest Hydroelectric dams and Fraser River bridges, and is home to the oldest known First Nations’ archaeological site in British Columbia. We offer a great escape from the city...outdoor spaces galore! As you #ExploreMission make sure to share your adventures with us on our social media channels. You never know where your photos could be featured.